There may be a huge number of gods and goddesses according to the Greek mythology. 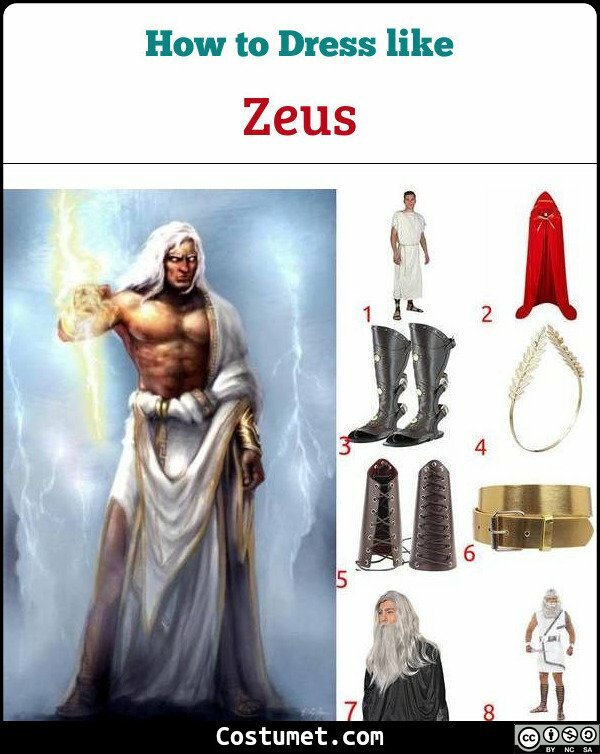 This article, however, will present to you the Zeus, who is married to Hela and often called as king and queen; Zeus, god of thunder, and Hera, goddess of marriage. Both wears a white Toga, a golden crown, golden gauntlets, a golden belt, and golden sandals. However, each will be decorated with specialized accessory and props. If you're interested in this look, please checkout our items list down below to see what you need to resemble this god-like look. 1 White Toga Get a plain white Toga to wear. 2 Long Red Cape Put on an extra long red cape. 3 Gladiator Styled Shoes Look for Greek style shoes to wear. 4 Golden Olive Crown Wear a golden olive crown. 5 Brown Leather Gauntlets Equipped in both arms with a pair of gauntlets. 6 Golden Belt Fasten a golden belt around your mid waist. 7 Long White Wig and Beard Look for a long white wig and beard to recreate an old god's style. It's a tale as old as the Greek era. On top of Mount Olympus lived the twelve Olympians, the major deities of the Greek pantheon, which includes the most recognizable names such as Zeus, Hera, Athena, Aphrodite, Apollo and so on. These pagan gods and goddesses' tales were told as the mere reflection of how human are; flawed and violent, created in the image of men. Yet, these supreme beings are immortal for they possess the natural power far greater beyond any men or women. He’s no good, not at all, but we can’t really say the same about his style. Old Gregg looks hilariously horrifying. He has seaweed hair, ugly green skin color, and he wears the most hideous outfit. He looks respectable in a black dress shirt, white necktie, and white blazer but utterly ridiculous in a pink tutu. As a king of Atlantica, KIng Triton wears a gold crown and armbands and owns a magical gold trident. He also has long white hair and beard, and a tail in ocean-blue color.